The border between Fashion and Art has always been very labile. In fact, one has always been an essential part of the other. This indissoluble union has led to the tendency of designers and artists to create unique pieces of art that could be worn. We all remember the accessories and clothes by Elsa Schiaparelli inspired by Salvador Dali‘s surrealism or, more recently, the Viktor & Rolf fashion show characterized by garments made with painting shapes. In this perspective of making portable and wearable objects, it was organized indossArte, the exhibition curated by Francesca Barbi Marinetti and Lucia Collarile. There are many artists who exposed their creations from December 7 to 10 at the gallery D.d’Arte of Rome. Let’s discover them together. First taking into consideration the jewels design, we meet Giulia Barela, a designer whose specialization is to use the lost wax casting technique. During the exhibition Giulia presented one of the jewels of her latest collection: the snake eye replicated in different shapes and materials. Then Gisella Gatto bases her works of art on painting. Le Quadrane® are miniature canvases with different shapes and techniques that can be worn every day as a conceptual manifesto that Art has value wherever we are. From painting we move to the craftsmanship of ironwork by Mauro Carrazza. 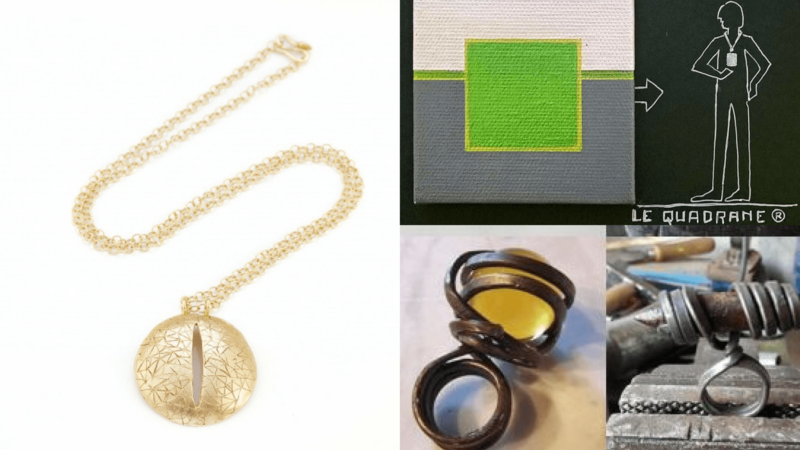 Ferrum Jewels are unique works that embody the tradition of handwork by directly beating the wire and the modern design of squared and minimalist shapes. Hi-tech and contemporary Art are the main concepts of Ludovica Cirillo‘s creations. From a recycling and technology perspective the brand byLudo presents jewels created through the use of small disused technological objects such as, for example, the keys of the computer keyboard. Elena Spirito in art Vanzuk, instead, use the collage technique. Precious colored papers in overlapping layers come to life thanks to the mastery of the artist in pendants, rings, but also brooches and pins for hair with elegant shapes, sometimes bizarre and grotesque. Moreover, now we talk about the accessories created by Barbara Guidi. Pins, headbands, clasps and hats real sculptures are made by the artist manipulating various fabrics, stones and small stones, metallic threads, ropes, feathers, silks, cottons and cashmere. Then the Barbara Salvucci‘s works are instead made taking into consideration the experimentation of the volumetry of the sign. The technique of the distribution of the volumes is developed in the scarf, in the dress and in the handbag exposed at the exhibition, creating games of plane lines that occupy imaginary spaces. From the geometry of Barbara Salvucci we continue with the surrealism of Elio Varuna who through mystical symbols with ultra-pop elements transports us to another dimension. 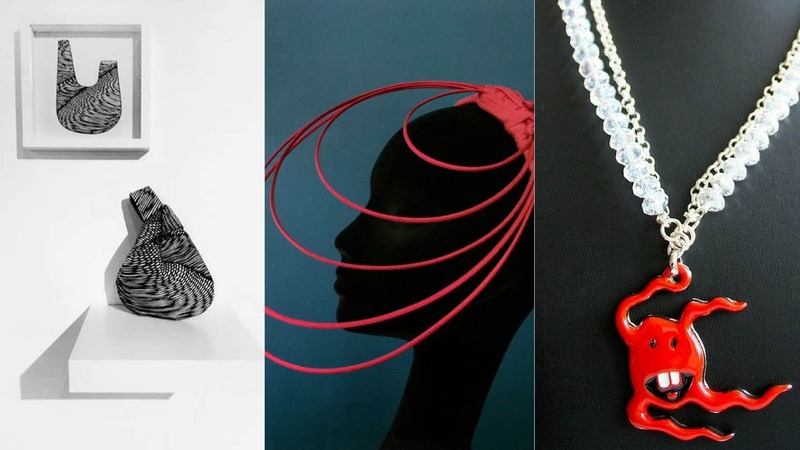 Tuty, a sort of red molecular entity, is the unmistakable signature of this artist who, besides dabbling in paintings and home furnishings, also designs t-shirts, jewels and hats. indossArte has also hosted two projects: MyDay-ByDay and REGENESI. 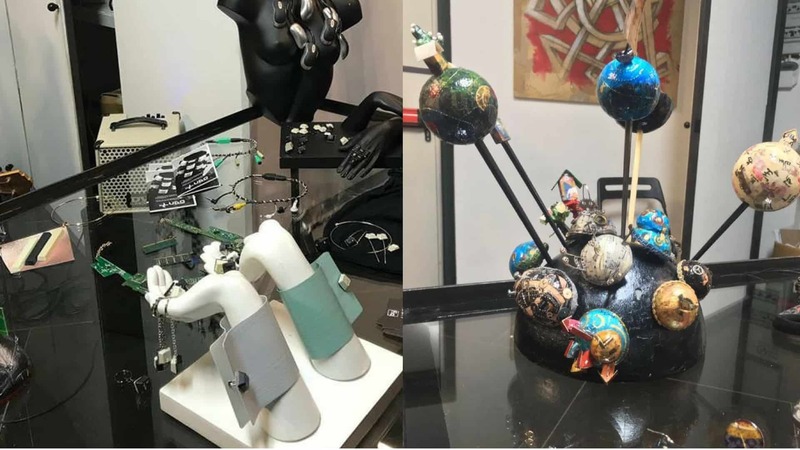 The first project of Laura Helena Aureli involves many national and international contemporary jewelry artists selected by the curator through the web and worldwide fairs. The second instead REGENESI deals with the sustainable transformation of post-consumer materials to create high-end objects and accessories, handcrafted in Italy by expert craftsmen. 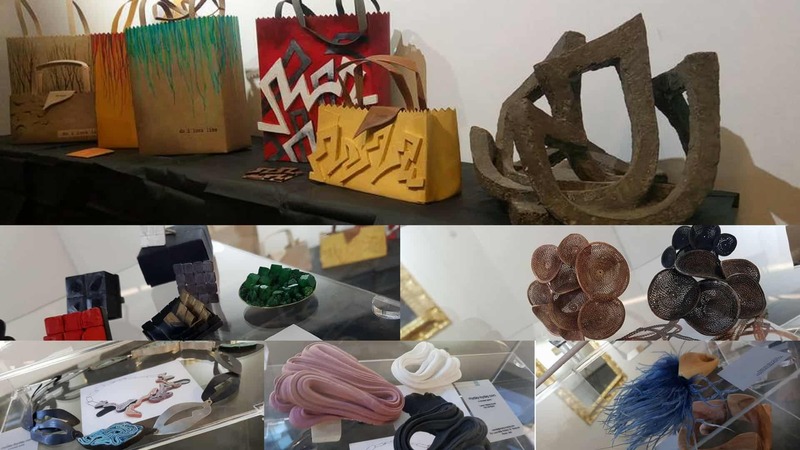 REGENESI presented some bags that are the result of the conceptual bas-reliefs of Gerry Turano, of the Flaminia Violati’s pyrograph technique, and of the lively painting of Carlotta Schiavio in art YaTii. We can say with great enthusiasm that indossArte is a fantastic project that involves great artists and allows us to discover wonderful works of art, with the opportunity to also wear them. Hope to see them again for the second edition.